Beano Comic is a classic children’s weekly comic which began in 1938. 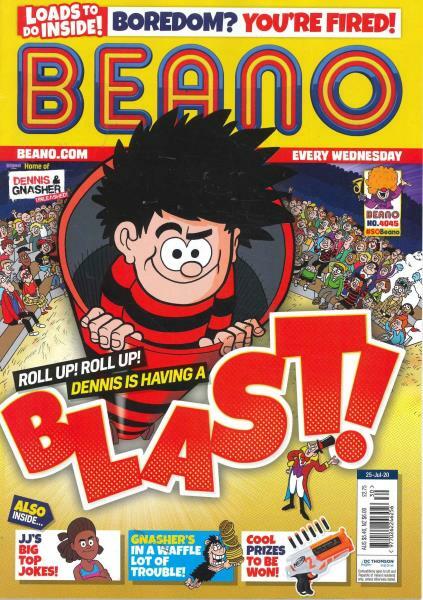 The word beano in English slang stands for a party or good time.Buy a single copy or subscription to Beano comic. Please note: Subscriptions do not include free gifts and Direct Debit orders are for a minimum 12 month term. It has been published weekly on a continuous basis with the exception of a time in World War II when paper and ink shortages caused the publication to be published every week until the end of the war. In 2009, the publication celebrated its 3,500th issue. Early issues of Beano, in particular, the first issues go for astronomical amounts at auction. The comic is so popular in Britain that it rates its own postage stamp which was issued by the Royal Mail in 2012. Major cartoon characters and residents of Beanotown in Beano Comic include Roger the Dodger, Dennis the Menace, Minnie the Minx, Calamity James, The Bash Street Kids, Ivy the Terrible, Ball Boy, and Billy Whizz. Retired cartoon characters, some of whom have returned to the comic series include Little Plum, Biffo the Bear, Lord Snooty, and The Three Bears. These characters are known and beloved by generations of British children. The characters whose strips have had the longest run include Dennis the Menace, Bash Street Kids, Minnie the Minx, Rodger the Dodger, and Lord Snooty. Readers have been able to play an influential role in which cartoon characters get the most play in the comic. The publication asks readers in reader polls which characters should return or get more action and what new strips readers want, and the publisher of Beano has listened over the years. My grandson can't wait for his Beano to be delivered, it's the highlight of his week. A classic, fun & enjoyable comic that my sons love to receive & read. I've been reading the Beano for over 40 years and now my daughter is as addicted as I was. The quality is and always has been excellent. Best magazine ever has to be the Beano, My son and daughter just love reading this, for that hour they are the best of friends when they get a new one each and then sit and discuss what will happen next. They keep all their old issues and reread them often, plus the bonus free gifts are just brilliant. Definately a magazine that is worth the price tag and dare I admit that when they go to bed I take a sneaky rad to catch up ith the latest going ons. :) a good old family favourite. Seeing his comic arrive always brightens my son's day. He loves it! My son is loving getting this weekly, great present!